Plastic scrap recycling often involves the use injection molding waste. 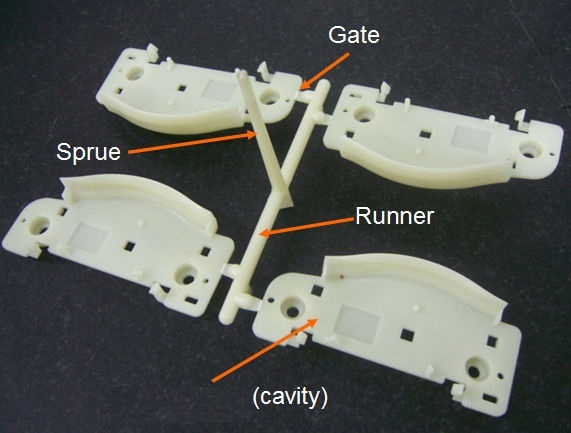 These parts are referred to as runners and sprues. Sprues and runner comprise the conduit that connects the machine nozzle to the machine cavities. During the injection phase of the molding cycle, the molten material flows through the sprue and runner to the cavities. These parts can be reground and mixed with new materials, primarily virgin resin. Creating what is referred to as ‘regrind’ is a major element of the plastic scrap recycling process. The proportion of regrind mixed with virgin material is generally based on the customer’s requirements. Regrind can have various characteristics different from the virgin pellets used. For instance, the melt flow could vary in small amounts from the resin. But these variations should have no impact on the final product as long as appropriate proportions are added. The formula should be standardized in order to develop a repeatable process. The product mold design determines how much regrind will be available. Small parts with many runners and sprues can produce a lot of material for reuse. There are different types of granulator machines to produce the regrind. High-speed granulators, for instance, are best used with polypropylene, while ultra-slow granulators are ideal for filled materials that non-plastic fibers that add strength to the original products. The ultra-slow granulator produces relatively large, uniform pieces with much less dust residue. This helps maintain the characteristics of the original product, including the length of the strengthening fibers. Other safeguards include material tags on the machine to prevent contamination with other resins. Additionally, each granulator is thoroughly cleaned before taking on a new project with a different resin. An added benefit to the cost-cutting effectiveness of plastic scrap recycling and the use of regrind is that it often reduces the weight of the recycled product, further making its use a practical solution for many manufacturing projects. The process in its entirety can also dramatically reduce the amount of excess that normally would be sent to a landfill.